Jealous of everyone who’s making it big on Instagram and rolling in cash? Want to get a million followers, but … you can’t even make it past 200 (and 199 of them are your own family members and friends)? Instagram influencers with over a million followers also started from 0 followers once upon a time. A ruthless Instagram marketing strategy, coupled with consistency and crazy determination led them to where they are now. And that’s what we’ll try to teach you here. 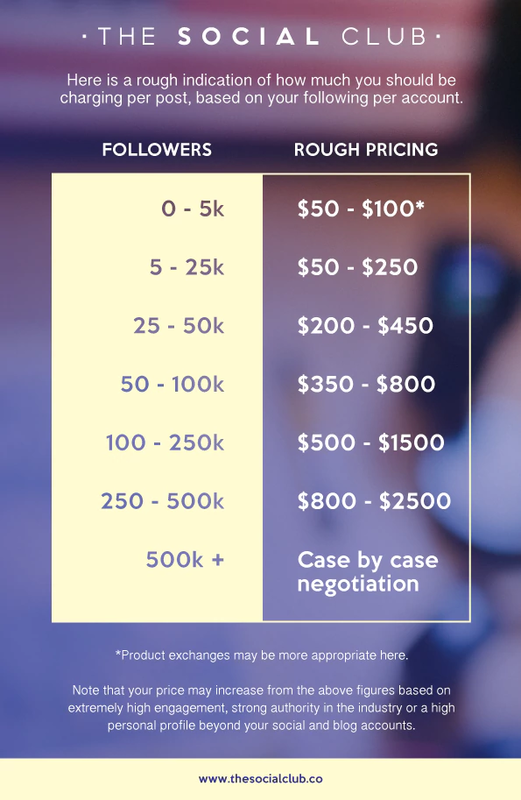 If you’d like to make money off your Instagram account then, according to The Social Club, this is what you can charge per post with the number of followers mentioned. Yep, pretty awesome isn’t it? The moneymaking possibilities of being Instagram famous are endless if you get to even tier 2 or tier 3 on Instagram. And it’s not all that hard either. So buckle up and get ready to learn how to get Instagram famous (also known as “insta popular” or “insta famous”). Before you start reading and implementing the tactics in this post, here’s what you need to have in place. Create a profile if you haven’t already. Add an aesthetically pleasing profile picture of you (or your brand), write a simple clean bio explaining who you are and what you do, and upload a couple of great posts to start with. Promoting an Instagram profile with horrible (or even mediocre quality) content is a complete waste of time. These tactics may bring people to your page, but they’ll give it a quick glance and disappear forever. So have a proper content strategy in place. What kind of content you’ll upload, different videos and posts that gel well with your niche, and so on. Give profile visitors a reason to follow you and stick around. Now, jump right into this post and start using these tactics, like yesterday. When you’re a nobody on Instagram, getting initial traction can be hard. Getting those first 1000 to 5000 people to follow you seems like a monumental task. You’re stuck at 200 followers, then a sudden burst takes it to maybe 800 (?!) and then you’re back to 687 followers the next day. Ugh. How do you get to 5000 genuine followers ASAP and retain them? At this point, your goal shouldn’t be to get your target audience to follow you specifically. It should just be to get to 5000 genuine followers quickly. Targeting your audience comes in the later tiers. This is how you’ll get initial 200 – 400 followers. Ask your close friends and family members if they’d give you shoutouts on Stories. Or they can even upload pictures with you and tag you in them. The first step is asking absolutely everyone to follow you on Instagram. Connect your Instagram profile to Facebook and follow everyone who shows up. This would prompt several of these people to follow you back. 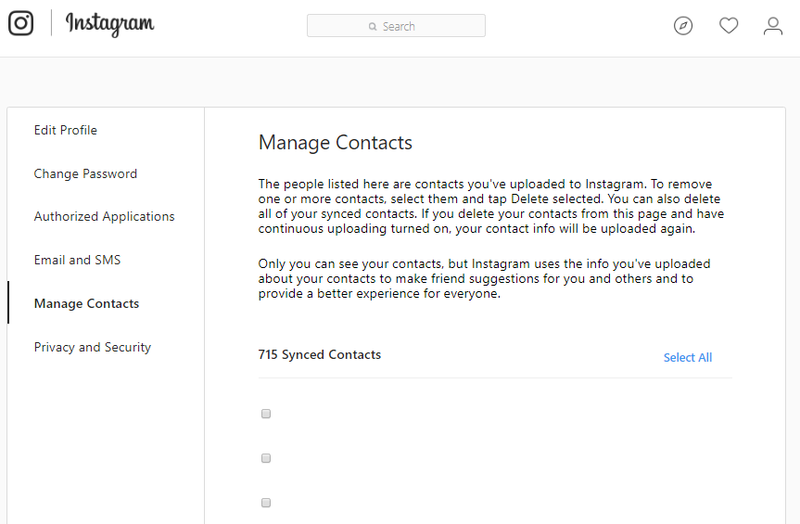 Another way is to connect your Instagram mobile app to your contact list and sync all those contacts. Follow ones that are on Instagram and hope that they’ll follow you back. Simultaneously, start liking and commenting on famous brands that your audience follow. If you’re a local brand, then engage with popular local IG accounts. This way you’ll get noticed by people who regularly engage with these accounts. The brand doesn’t receive over 25 to 40 comments, otherwise, your comment will get lost amidst all the others. So the brand should be popular, but not TOO popular. Don’t comment crap. Take out 100 seconds to comment intelligently. Make a list of popular accounts in your niche, raid their follower lists, and start liking 100 to 150 pictures in each account. So let’s say, Alice, is a semi-popular influencer in your niche, travel. She has 10k followers. Go through her followers’ list (or you can even hunt in the comments section of her posts and click on profiles of people who’re really active and enthusiastic). Charlie follows Alice. He’s a huge travel enthusiast, has a public profile, and a ton of pictures. Like all his travel-themed pictures. Even if they’re a 100. Comment on a couple of pictures. Shouldn’t take you more than 10 minutes top. Target at least 10 to 20 accounts each day. Do it frequently enough to get noticed by these people. Search for 10 trending hashtags in your niche. You can use Hashtagify or Display Purposes for that. Comment on all the 9 top posts that show up. You can also tag people on it or repost them. But commenting is the most effective way of getting noticed. That’s a total of 90 posts. Follow this every single day till you build a list of loyal, like-minded followers who all like, comment, and repost on each other’s posts. ‘Remember, nobody listened to me at first either. Let me say it one more time. For over a year, nobody watched my damn shows on YouTube. Tagging pics with hashtags like #passionpassport that effectively “submit” you to be featured on a larger page is big. If you get featured on @passionpassport you probably get 1k+ followers overnight and it continues for a long time. Find out similar, hugely popular trending hashtags that were started by large pages and use them repeatedly for a chance to get featured. You can also tag popular pages like WestElm, Warby Parker, REI and others that post a ton of USG content if you use their products. P.S. Keep an eye on Instagram’s Weekend Hashtag Project for every week’s trending hashtags. Select 10 to 15 Instagrammers with a similar number of followers or just a tad bit higher, and build rapport with them over a period of few days or a week. Next, DM them and ask if they’d give you a shoutout in exchange for a shoutout. Don’t hijack their posts and annoy the crap out of them by writing s4s in the comments section before engaging with them. No one likes that. This kind of conversation needs to take place privately and after a thorough engagement. Also, search for shoutout accounts in your niche and DM them asking if they’d give you a shoutout. Sometimes they ask for a little payment, and sometimes they won’t. So keep trying. 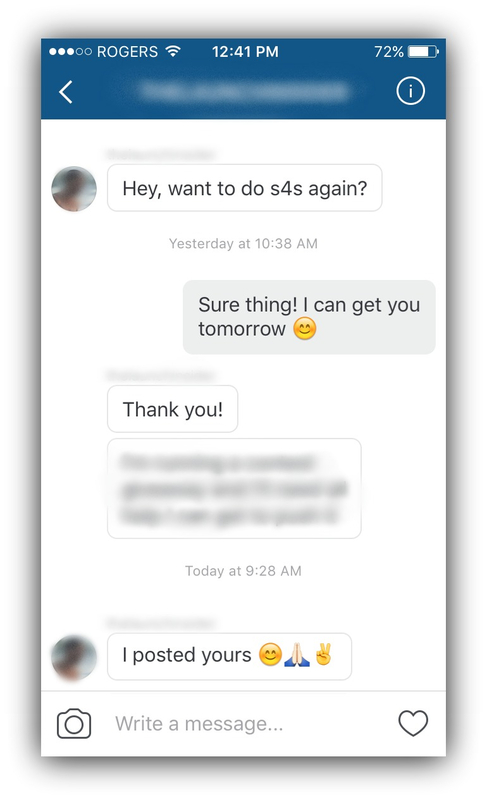 Send an s4s request a couple of times a day to different pages to increase its effectiveness. Engagement groups, also known as support pods for some people, are small communities with 10 to 15 Instagrammers, all committed to engaging with each other on Instagram. And you know that the more engagement your posts receive, the higher up they’ll show on your follower’s feeds. You can create a group on WhatsApp, Facebook, or any other social platform and invite Instagrammers you’re friendly with, or just join one of the many groups available online. 3 to 6 months if you work like an obsessed person and follow all these strategies. The first 5k followers are the hardest. From then on, it does get easier. You’ll even see hundreds of people following you in a single day. But, you still need to work for it. Keep doing all the things you were (to get the first 5k followers) and start incorporating the following tactics in your Insta-famous plan to become a part of the esteemed 50k followers club. We’ve already discussed shoutouts and S4S strategy in detail as one of the core strategies for getting your first 5k followers. Now you need it to amp it up a little. You’ve got a substantial amount of followers and most brands will be happy to collaborate with you. So make a list of pages in your niche with around the same number of followers you have, follow them, comment on a couple of their pictures and send them an S4S request. Do it at least 20 times a day. Go crazy. Hire a virtual assistant or an Instagram Manager if you have to, but do it. To further increase your chances, send them an email to ask if they’d be interested in s4s. Talia Koren, at Work Week Lunch which has an astounding 114k followers and counting. Posting consistently, minimum once every day, is the key to gaining followers at this point. When you’re aiming for 5000 followers, you can afford to post less and reach your target followers with a 100 posts, too. But at this stage, you need to put up new, epic content constantly. The more you post = the more engagement your posts will get = the more chances of them ending up in the top 9 posts in a trending hashtag you used and on the explore page = the more followers you get. However, don’t post crap content. Don’t post low-quality pictures or meh graphics to fill up space. Post aesthetically pleasing posts, follow a theme for your feed and repost (ethically and legally) if you fall short. If you’ve got a big marketing budget and along with getting new followers you also want to promote your products/services, then boosting posts on Instagram would work great for you. If you can break even on boosting a post promoting a product, then additional followers they get from it are a bonus. Start investing some moolah in Instagram’s paid advertisement features. You can promote your brand story, your posts, or even create a fully immersive Canvas ad videos. Start posting Instagram stories (if you hadn’t started yet), but do it strategically so that it gets featured higher up on Instagram’s Explore page. Add geotags and trending hashtags in your stories so that they appear in a public Instagram Story, landing you more eyeballs. Dive deep into Instagram Analytics and use this data to finetune your Instagram marketing strategy. Focus on replicating tactics that worked for you and creating posts that performed best to get hordes of new people to your profile. Increasing engagement by asking simple questions in your caption. Ever saw Instagram post captions that ask you to “tag your friends who are like this,” or “double tap if you agree”? This is an excellent tactic to amplify engagement and get extra eyeballs on your post. The best time to start posting captions that prompt immediate action is when you have a couple thousand followers. So even if you can’t think of a fancy caption to go with your post, ask your followers a simple question. They’re almost expecting to see a CTA engage with you on Instagram. Don’t disappoint them. Run giveaways for crazy, instant growth. Loop giveaways are even better. Instagram accounts that hold giveaways (aka contests) achieve 70% faster follower growth compared to those that don’t hold. Our customer data completely supports this stat. A male fashion influencer got 500 new followers overnight for < $200. 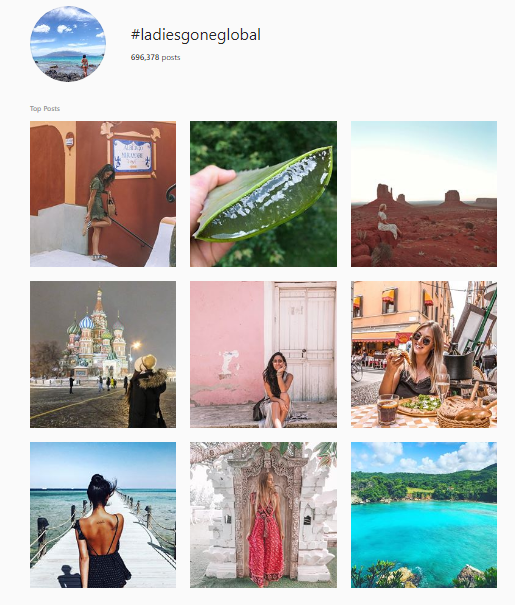 A female travel blogger got 2000+ followers with only 1 IG post. A beauty brand got 10k+ followers over the past 3 months with loop giveaways. One company got 6k followers in A SINGLE DAY, and 80% of them stayed after 1 month. Giving out a free product in exchange for tags and shares is a great way to reach out to friends of your followers. An even better way is to collaborate with influencers or other Instagrammers in your niche, and run loop giveaways. It’s when Rachel, Chris, Jennifer and Robert all have a similar amount of followers, say 1000. They pool in their products to create a giveaway together, where followers of all 4 accounts are asked to tag friends and like all 4 pages to enter the giveaway. Read all the deets about them here. “Users can use Instagram’s Explore feature to find posts related to trending hashtags such as #LoveWins, #CanadaDay, and #FullMoon. If these trending tags are relevant to your brand, include them in timely posts to aid discovery. On the topic of search, Instagram also introduced the ability to search by emoji.” – Jim Tobin, president of Ignite Social Media. You can add up to 35 hashtags in each of your posts, so use them wisely. If you’re in the travel niche and you use the hashtag #travel, your post will disappear so fast amongst new posts popping up every second, that you won’t even get to say ‘WAIT!’. Make a list of hashtags niche influencers are using and search their popularity. 6 months – 2 years if you work at it consistently but don’t spend a boatload of money or have any very lucky breaks. This part’s a little tricky. Several people get lazy at this point and their followers start dropping like flies. You need to get even more aggressive. You’re almost at the finish line. Now you’re playing with bigger players and with the right amount of determination, strategy, and consistency you can reach 200k in a very short time. Now that you’ve crossed 50k followers, you can start collaborating with accounts of similar and higher follower count in S4S. Join WhatsApp groups, Facebook groups, Skype groups and all other social groups where Instagrammers are grouping together to engage in some high-level shoutout for a shoutout. Aim for 20 to 30 S4S daily. DM pages similar to yours if they’d be interested in S4S. If you come across a page on Explore or your feed that’s giving a shoutout to some other page, you know they’d be open to shoutouts so send them a DM. Here’s what a Reddit user said about his experience with s4s. Once you hit the coveted 100k mark, you can engage in S4S with bigger (100k, 150k, 200k, and even 300k followers), which will further amp up your followers. This is the single best strategy to quickly increase your followers from here on. If you find the right groups and teams to collaborate with, your Instagram account will explode. Actively try to get featured on larger accounts in your niche. If an account with 200+ followers reposted your content on their account, that’d be awesome, right? Research and make a list of uber-popular Instagram accounts in your niche. Go through their feed to see if they post user-generated content. Make a list of common hashtags these posts add to their captions to get discovered. 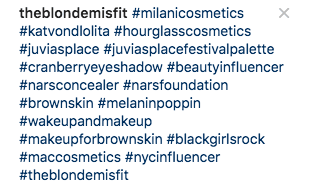 These hashtags could be a part of a bigger UGC campaign, or a new product/service, or simply their brand’s branded hashtag. Create amazing content that can get featured on these accounts. Start boosting engagement on that post right away. For example, Huda Beauty is one of the top beauty influencers on Instagram and most of her feed is filled with reposts of her followers. What can beauty enthusiasts do to get reposted by her? Follow her absurd, viral beauty trends and make epic quality videos, hashtag their videos with #hudabeauty, #(whatever her newest product is). DM, her with the video link, send her an email with the Instagram post link, engage with her on her posts, engage with other beauty bloggers on her post, keep creating epic content and boost it’s engagement like a madman through engagement groups, cross-promotion, and other strategies so it gets noticed ASAP. 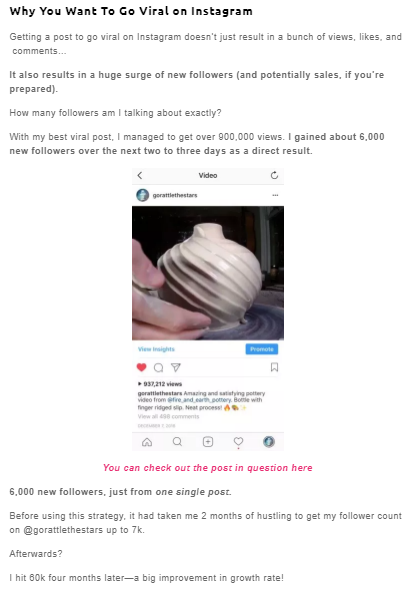 Brie, of the Fire and Earth Pottery, got a lucky break and her follower list went insanely high as a result of it. Do these hashtags look familiar? UGC campaigns are where you create a branded hashtag around a theme and ask your followers to use your hashtag and post content related to the theme. There’s usually a gift involved; either free products, gift cards, and the likes, or simply the chance to get featured on your Instagram page. The increases your brand reach to followers of your followers, which an excellent way to get more followers. It’s simple math. If you have 50k followers and even 0.01% of your followers participate in your user-generated campaign, and they have at least 100 followers each, you’ll still get the reach of roughly around 50,000 people, which is beyond epic. If you run a product based business, giveaways can be your best friend at this point. They’ll multiply your followers SO fast you’ll go dizzy just looking at the numbers. Keep it simple. Make a gigantic goodie bag with all your best selling products, put them up on Instagram and simply ask followers to tag 1 or 3 friends in the comments section for a chance at winning this goodie bag. Take over other influencers’ account for a day or week to get acquainted with their followers. Ask accounts with a similar number of followers if they’d be interested in account swapping for a limited time for mutual benefit. Chances are, if you’ve built a little rapport with them, they’d say yes. Because isn’t everyone trying to increase their followers, engagement, and general Insta-popularity on Instagram? Buffer uses this strategy with great success. The Weaving Kind, a page that features and discusses all things related to fiber weaving and has over 55k followers, regularly hosts different Instagrammers on their page. 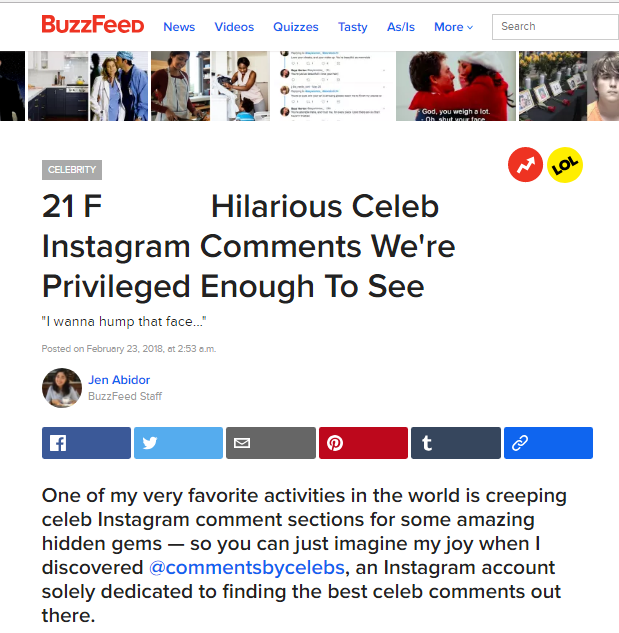 Get your account featured on viral websites like Buzzfeed. Do you dream about amazing, rapid, viral Instagram growth at night? It’s okay, I do, too. And you can hit a few jackpots if you create strategic, calculated content that has the potential to go viral outside of Instagram. 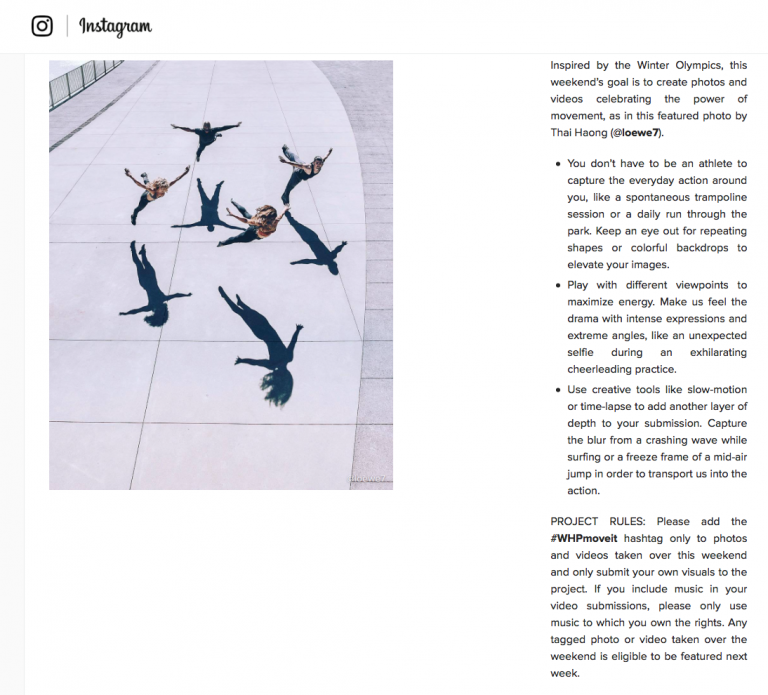 Websites like Buzzfeed, Cracked, and Reddit embed a lot of Instagram content in their posts that go viral the instant they hit ‘post’. If your post is one of them, you can get hundreds and even thousands of followers by the time you roll out of bed the next morning. Create interesting, funny content that revolves around breaking news in your niche. Find out which authors cover your niche at viral blogs. Use hashtags trending around this news. Tag the authors in those posts. Engage with them. Try it consistently, especially when there’s a big event that’s likely to get covered or if you can hashtag a general popular event like the #royalwedding. Embed your Instagram posts in guest posts, your own blog posts, other social accounts, etc. At this stage, repurposing content for all your different social and digital platforms is the key. Use your twitter, facebook, Pinterest account and share your Instagram posts there. Write blog posts on medium, LinkedIn, on your own blog, or guest blog on gigantic websites. Add a link to your Instagram profile everywhere. Varies from niche to niche and account to account. High probability of being 1-2 years at the very least. You’re famous now. Congratulations. (Leave a comment here and I might DM you asking for your shoutout rates! j/k. Or not.) But you’re pretty damn famous now. Almost celebrity level, but not quite. So how do you hit that ultimate mark of 1 million followers on Instagram? After all your hard work and digital sweat, you finally get to play with the major players on Instagram. The first game is Thunderclap. 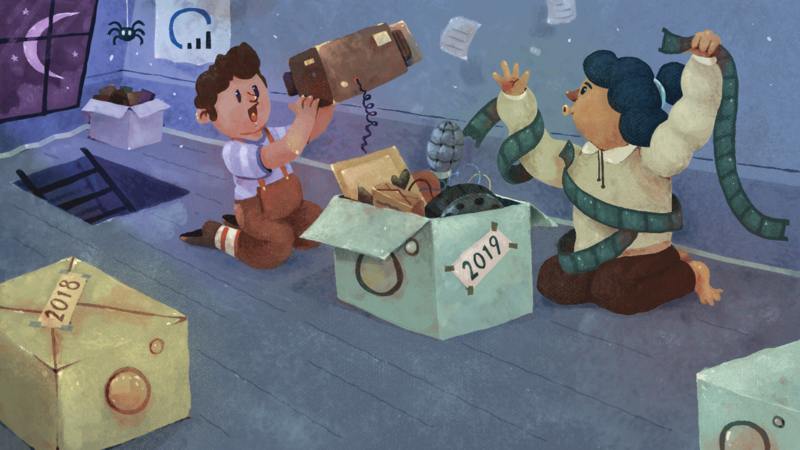 This is where you collaborate with Tom, Charlie, and Jack (they all have well over 200k followers) and make a team where every day the three of you give a shoutout to one of the team members at the exact same time for magnified effect. So one bright sunny day, you’re sitting on your desk minding your own business and you suddenly see a crap load of notifications on your IG with thousands of new impressions on your posts, likes, comments, and followers, your eyeballs widen and your heart starts beating insanely fast. What. Just. Happened. And then you remember it was your turn at getting thunder clapped, and you got a shoutout in front of over 600k people, so some were bound to come your way. You can also just approach micro-influencers and ask them to work with you on this strategy. Learn from Daniel Wellington, the brand with the most gorgeous watches and an epic thunderclap micro-influencer strategy in place. I’ve seen a lot of large influencers use this strategy and it works out great for them. Make friends with other influencers in your niche or industry, and take pictures with them at industry events, conferences, and even random (totally staged) coffee breaks. Now upload these pictures on Instagram and Stories and tag them. Ask them to do the same. “These mountains that you are carrying, you were only supposed to climb.” @najwazebian has become one of my favorite people for who she is in the world, her deep care for humanity, and her poetic voice that makes me think a little deeper. Loved spending time with her this weekend in Toronto and make sure you check her and her book Mind Platter out if you want more inspiration. Comment below if you love her work already 🙌 . . Thanks to @matthew.robin for the pic check his work out if in Toronto! It’s a great way to reach out to their 100k followers or so. Hustle to get featured outside of Instagram. Approach popular podcasters to get featured, collaborate with popular YouTube influencers to host videos with them on YouTube, try to score a spot on Oprah’s show, write or co-author a best-selling book, get interviewed by popular bloggers, and so on. Now that you’re officially an Instagram influencer, the possibilities of getting featured on popular spots outside of Instagram are endless. And this would, in turn, multiply your followers. This one’s a little controversial so do it at your own risk. Some time back Neil Patel, digital marketing influencer, grew his Instagram account by paying popular stunning models who’ve made it big on Instagram to promote him. I do not approve of this objectification at all, but it got Neil the results he wanted. Google searches for his name grew by 71% and 0.2% followers of each model followed him. Or, just sleep all day, every day while your newly hired butler brings you coffee and laptop in bed. You’ve made it. You’re a big deal now. Good job! Is Becoming Instagram Famous Worth It? If you had a million followers, what would you do?